Penelitian - Researchers have described a remarkable new species of fish that lived in the sea about 150 million years ago in the time of the dinosaurs. The new species of bony fish had teeth like a piranha, which the researchers suggest they used as piranhas do to bite off chunks of flesh from other fish. 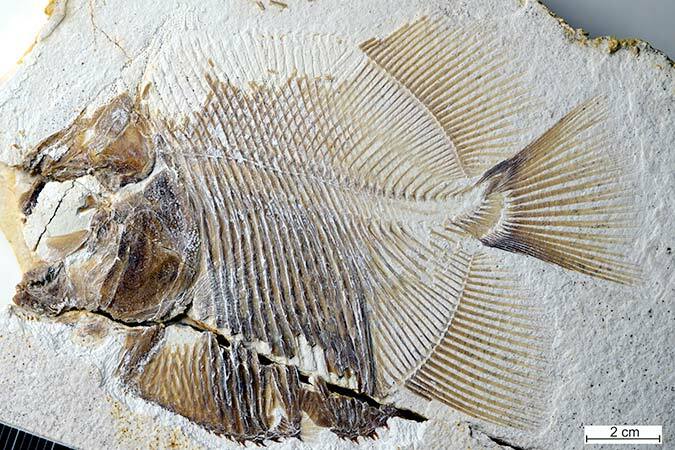 As further support for that notion, the researchers also found the victims: other fish that had apparently been nibbled on in the same limestone deposits in South Germany where this piranha-like fish was found. "We have other fish from the same locality with chunks missing from their fins," says David Bellwood of James Cook University, Australia. "This is an amazing parallel with modern piranhas, which feed predominantly not on flesh but the fins of other fishes. It's a remarkably smart move as fins regrow, a neat renewable resource. Feed on a fish and it is dead, nibble its fins and you have food for the future," Bellwood says. The newly described fish is part of the world famous collections in the Jura-Museum in Eichstätt. It comes from the same limestone deposits that contained Archaeopteryx. Careful study of the fossilized specimen's well-preserved jaws revealed long, pointed teeth on the exterior of the vomer, a bone forming the roof of the mouth, and at the front of both upper and lower jaws. Additionally, there are triangular teeth with serrated cutting edges on the prearticular bones that lie along the side of the lower jaw. The tooth pattern and shape, jaw morphology, and mechanics suggest a mouth equipped to slice flesh or fins, the international team of researchers report. The evidence points to the possibility that the early piranha-like fish may have exploited aggressive mimicry in a striking parallel to the feeding patterns of modern piranha. "We were stunned that this fish had piranha-like teeth. It comes from a group of fishes, the pycnodontids, that are famous for their crushing teeth. It is like finding a sheep with a snarl like a wolf. But what was even more remarkable is that it was from the Jurassic," says Martina Kölbl-Ebert of Jura-Museum Eichstätt (JME-SNSB). "Fish as we know them, bony fishes, just did not bite flesh of other fishes at that time. Sharks have been able to bite out chunks of flesh but throughout history bony fishes have either fed on invertebrates or largely swallowed their prey whole. Biting chunks of flesh or fins was something that came much later," Kölbl-Ebert says. The researchers call the new find a "staggering example of evolutionary versatility and opportunism." With one of the world's best known and studied fossil deposits continuing to throw up such surprises, they intend to keep up the search for even more fascinating finds. "The new finding represents the earliest record of a bony fish that bit bits off other fishes, and what's more it was doing it in the sea," Bellwood says, noting that today's piranhas all live in freshwater. "So when dinosaurs were walking the earth and small dinosaurs were trying to fly with the pterosaurs, fish were swimming around their feet tearing the fins or flesh off each other," says Bellwood.